Colorado, a horse owned by a Phoenix horseman, is airlifted to safety after he was stranded on a sandbar in the Gila River near Buckeye, about 50 miles from central Phoenix. Colorado’s owner, and some of his friends, were on a trail ride in the Gila River basin last week when they tried to cross the normally placid stream and were caught up in current of the swiftly flowing river, swollen by one of the rainiest winters in Phoenix in years. The people, and most of the horses, were saved by rescuers. But Colorado was swept downstream to the sandbar and another horse had to be put down because it broke a leg. Rescuers tried to get to Colorado but the swollen river made it unsafe, even in a boat. 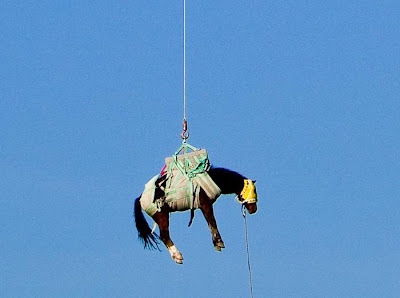 The only way to get the horse back to solid ground was to airlift him across the river. Early Tuesday morning a team of rescuers boarded the helicopter and were shuttled to the sandbar. They sedated, blindfolded and trussed up Colorado like a Thanksgiving turkey and the helicopter plucked him off the sandbar for a 45 second flight back to his owner. It was a good story - a man desperate to save his horse, a horse he raised from birth, and the resources that it took to reunite horse and owner. But I wonder how important a story it was. Arizona is in the midst of a paralyzing budget crisis. More than 300,000 people are being thrown off the state’s medicaid rolls. All day kindergarten and health care for children are being eliminated. The state’s unemployment rate is hovering around 10 percent (and the most solid growth sector of the economy, health care, will take a huge hit when 300,000 people lose their medicaid insurance). And every television station in town dedicated huge resources to covering every second of a horse rescue, some even took it live. I wish they put the same effort into covering the state’s political and budget crisis. Instead Phoenix TV stations seem more concerned about covering pet stories, car chases and “paying it forward” stories, They’ve abdicated their responsibility to operate in the public interest. Don Henley summed it up 27 years ago when he sang about “Dirty Laundry,” “We got the bubble-headed-bleach-blonde who comes on at five”.